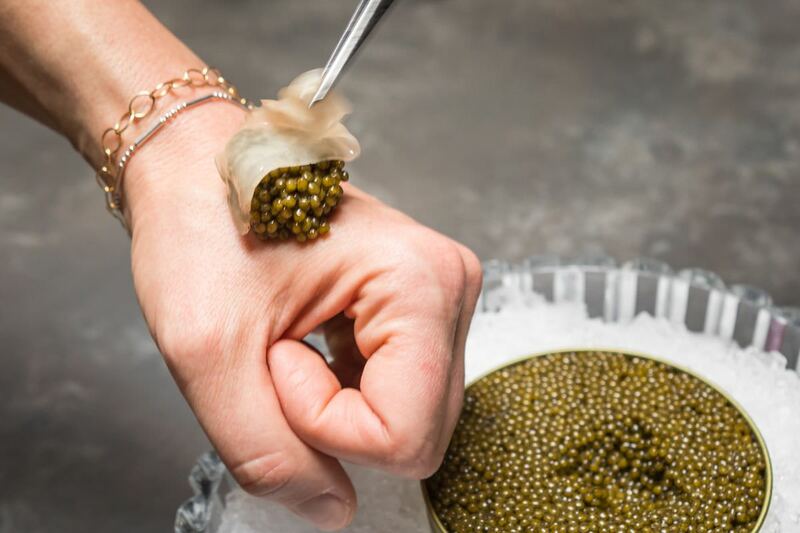 If a server ever asks you to present the back of your hand for a “bump” of caviar wrapped in a sliver of wagyu fat and topped with a dollop of smoked crème fraîche, settle your bill and leave immediately. San Francisco's Avery offers this amuse bouche, served with its reference to a line of cocaine, on its tasting menu, but its meals are sold online in advance so escape isn't an option. Diners at the Fillmore St. restaurant have the choice of two menus—”Bouquet by the Sea” (10-15 courses, 2.5 hours, $189 per person) or “Cello Player” (7-8 courses, 1.5 hours, $89 per person). If you'd feel comfortable telling your server, ”I’ll have the Bouquet by the Sea,” then Avery may be for you. If tasting menus, in which numerous small courses of the chef’s choice are served as a single meal, San Francisco’s your kind of town. Atelier Crenn (“Each guest is greeted with a poem, each line symbolizing a presentation in the meal”) offers one for $335, with wine pairings beginning at $175. Saison’s is $298 (paid in advance and non-refundable) and Benu’s three-hour extravaganza is $295, which doesn't include the 20 percent service charge or wine. Think of the tasting menu in musical terms—it’s the guitar solo of the culinary world. Done well, like Elliott Randall's impeccable 30-second intro to “Reelin’ In The Years,” it's the perfect length and there's not a wasted note. But you might get the gustatory equivalent of Peter Frampton’s self-indulgent noodling on “Do You Feel Like We Do.” Put another way, a well-executed tasting menu is like the jazz of the 1950s and 60s. Trust the wrong chef, however, and it becomes the corporate rock of the 70s. And trusting the chef is what the tasting menu is all about—you put yourself in his hands and accept his whims. That's “his,” because female chefs don't seem enamored of this trend, perhaps because they're not so caught up in the competitive aspect—Oh, you do 15 courses? Then I’ll do 20 with sensational mouthfeel, and they'll all be hand-pulled, hand-cut, hand-glazed, bespoke, deconstructed, and curated! The tasting menu, which starting popping up in the 1970s but really bloomed in the 90s, has led to observers calling some chefs “totalitarians” and “tyrants.” It became all about them, and not about what and how much the customer wanted to eat. The ascension from faceless kitchen workers to culinary stars gracing magazine covers and preening in their starched chef’s whites in open kitchens left some chefs with swollen heads and the urge to control. For the privilege of eating at his esteemed Napa Valley restaurant, The French Laundry, chef Thomas Keller once required worshipful diners to consume 40 separate courses—nothing less than total submission would suffice. Keller’s justification for serving many small courses—that the palate tires after a few bites, after which diminishing returns sets in—makes sense, but certainly the spirit begins deflating when you're 20 courses in with 20 to go. Three or four meticulously prepared dishes would be a superior experience, and so much less exhausting. In the hands of a master chef, the tasting menu can offer a memory that will last a lifetime. The finest one I ever had was in Kyoto with my dad, at a kaiseki restaurant. We sat at the counter and chatted with the chef as he handed us more dishes than I can remember, each of them more exquisite than the previous one. Some seemed too beautiful to eat, which is a specialty of Japanese chefs. The meal didn't last three hours though, and we didn't feel bloated as the chef walked us out to the bus stop, shielding us from the rain with his umbrella. Shortly thereafter, a handwritten letter in Japanese from him arrived in my mailbox in Tokyo. But then there was the tasting menu I had on Maui a number of years later, at a place in the Four Seasons in Wailea where I knew the head chef. That can spell trouble because it can feel like they're trying to kill you with generosity. I’d eaten way too much of the excellent food (tuna tartare, soup, salad, lamb, beef, opakapaka and other local fish) way before the last course came out, and when the server announced all the deserts that would follow, I wanted to find a way to sneak out of the place. The meal was an endurance contest I'd lost, and I'll never forget the dread between courses I started to feel at a certain point. Something similar, although less severe, happened to me at a fine Japanese restaurant in Washington, D.C. a few years ago, so I've given up on tasting menus. I need to be able to choose exactly what I eat now. I don't want any bumps of caviar on my hand or poems read to me, and I couldn't bear to order the Bouquet by the Sea. If you happen to be in the mood for one though, do your due diligence. The kaiseki chef in Kyoto probably swept the floors of his first restaurant for a couple of years before his chef allowed him to prepare rice for the first time. If you're going to shell out $500 for a meal, it's good to make sure your chef has paid his dues.